Forget West Ham’s shock 3-0 win away at Tottenham for a second and the Hammers present a strong case for the most disappointing start to the Premier League season. Promoted Crystal Palace and Cardiff City were expected to struggle, Mark Hughes is busy trying to change Stoke’s bad habits after taking control in the summer and Norwich have already faced Arsenal, Chelsea Tottenham and Everton in their opening eight fixtures. The less said about Sunderland, Paolo Di Canio and his 14 new players, the better. Other than the success at White Hart Lane, Sam Allardyce’s side have picked up maximum points on just one other occasion – in their season opener against Cardiff. They have lost four games, most notably away at Hull and at home to the goal-shy Potters. Their measly haul of eight points from eight games leaves them 15th in the table, just a point away from the relegation zone. The Upton Park faithful are rightfully concerned, particularly with record signing Andy Carroll still sidelined through injury. 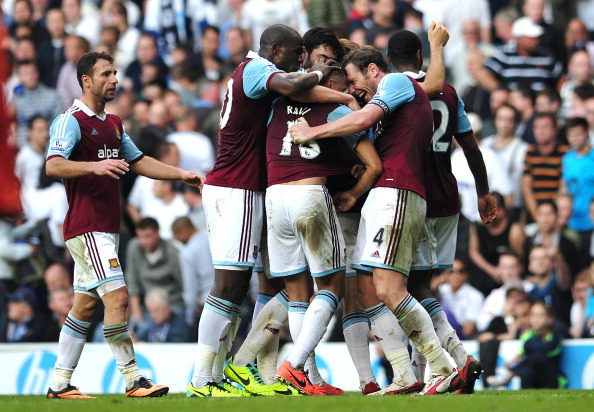 Other than their problems up-front, a factor in the club’s poor results has been the form of captain Kevin Nolan. Or, more precisely, the lack of it. The 31-year-old has become synonymous with the east Londoners since arriving from Newcastle in 2011 but this season he has failed to recapture the sort of performances which have made him such a favourite among the Upton Park faithful. Despite starting every league game since the new campaign kicked-off back in August, Nolan has found the back of the net just once from an often advanced role in central midfield. Last season he netted 10 goals in 35 appearances, a return which left him as the club’s top-scorer. That can be partly explained by a huge drop in his shooting accuracy, which has fallen to just 10% – the lowest of any midfielder in the top-flight – from 58% last season. 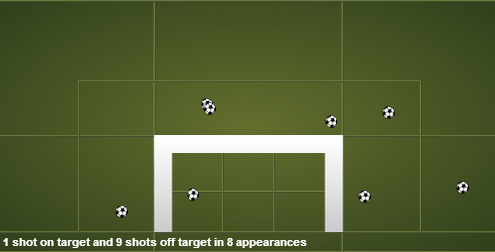 In fact, he has hit the target just once so far, for his goal against Cardiff on the opening day of the campaign. The former Bolton man was also a much more creative influence last season, making 27 chances for his team-mates compared to just two in eight games so far. He is yet to lay on an assist in the league, although he does have plenty of game-time to match or better his two from 2012/13. One area where Nolan has improved slightly is defensively, winning 72% of tackles compared to 69%. He’s also won 36% of his headers, a marginal improvement on the 31% he managed last term. His passing accuracy of 79% remains identical to last season but still leaves a lot to be desired as he’s ranked 34th among the 41 midfielders to have appeared in all eight league games so far. Nolan’s poor displays have left him with a Squawka Performance Score of -28, the lowest in the West Ham squad and third-worst among all midfield players in the division. He’ll have to improve significantly if he’s to turn things around and reach the respectable 480 he managed last season. Some of Nolan’s struggles can be put down to the absence of Carroll – his friend and offensive partner – but the statistics prove that the England hopeful is not reaching his potential in claret and blue. That will be a worry for Allardyce, who will need his skipper to lead by example to stop a disappointing start developing into something more serious.